NEW ORLEANS – The NCAA Division I Cross Country Champion Providence women and the Northern Arizona men have been named the U.S. Track & Field and Cross Country Coaches Association (USTFCCCA) Division I Scholar Teams of the year for the 2013 cross country season among 217 women’s programs and 160 men’s programs that earned All-Academic Team honors. Providence and Northern Arizona, which finished runner-up at the NCAA Championships, earned the honor as the highest-finishing teams at NCAAs to have earned All-Academic Team honors by compiling a cumulative grade point average of at least 3.0. En route to their first national cross country title since 1995, the Friars of Providence collectively earned a 3.38 cumulative GPA behind five individual All-Academic selections. That total tied them for the most among Division I women’s programs with Colorado. Providence earned its national title with a winning score of 141 to runner-up Arizona’s 197 with three All-Americans in Emily Sisson, Laura Nagel and Sarah Collins – all of whom earned individual All-Academic honors. The Friars’ season also included team wins at the Northeast Regional, the Big East Championships and the Coast-to-Coast Battle in Beantown. This is the first time Providence has earned Scholar Team of the Year honors, though it is the fourth time in five years the Big East Conference has produced the winner dating back to Georgetown in 2011 and Villanova in 2009 and 2010. Northern Arizona earned a cumulative 3.34 grade point average on its way to a runner-up showing at the NCAA Championships. The Lumberjacks’ roster featured two individuals who earned All-Academic individual honors, including All-American Brian Shrader. With 169 points, Northern Arizona finished just 20 points behind national champion Colorado, tying its highest finish in program history. The Lumberjacks also notched team victories at the Mountain Regional over eventual champion Colorado, the Big Sky Conference and the Wisconsin adidas Team Invitational. This is the first time the Lumberjacks have won the award since it debuted in 2006. NAU is also the first winner from the Big Sky Conference. 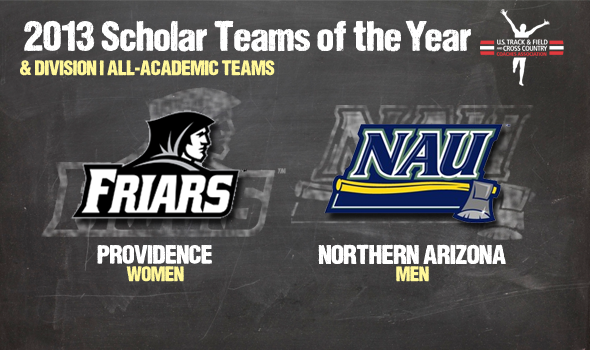 The Scholar Teams of the Year were among 217 women’s teams and 160 men’s teams that earned All-Academic Team honors for the 2013 season. Programs must have compiled a cumulative GPA or 3.00 or greater to qualify for the award. In total 231 unique programs were recognized, including 146 programs that had both their women’s and men’s teams earn the honor. The Southern Miss women reported the highest team GPA at 3.79, while the Chattanooga men topped their gender with a 3.71. The SEC led all women’s conference with 13 teams earning All-Academic honors, followed by the ACC with 12 and Conference-USA and the Big Ten with 11 apiece. Men’s conferences were headlined by the Atlantic 10, the SEC and the ACC with nine teams each, followed by the MAC with eight.